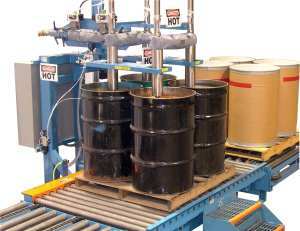 Filling four drums automatically with liquid is fairly easy, but filling them with a putty-like product through a liquid filling machine is a real challenge; such was the case when a nationwide manufacturer of high-grade sealants presented its problem to the staff at Specialty Equipment Company. In this case, the sealant manufacturer wanted to fill a highly viscous product into 55-gallon, open-top and tight-head drums. The product had to be heated in order to flow through the piping. Even then it still flowed slower than molasses. The solution developed by Specialty Equipment was to build the filler with four heat-traced lances to maintain the necessary 180°C temperature for the most viscous product to flow. Because the product is so dense, it requires 30 minutes to fill each drum. Prior to the new quad filler, the operator would stand at a single-lance filling machine for 30 minutes until the drum was filled, before starting another cycle. The idle time for the operator, who read magazines for 30 minutes, prevented any suitable payback for the customer. Specialty Equipment’s new quad filler automatically fills each drum in sequence, which freed-up the operator for two hours at a time. Now, during the two-hour fill cycle, the operator performs other tasks, such as loading empty drums, bunging, capping, labelling, cleaning and in some cases he even operated another machine. "Specialty Equipment’s new quad filler automatically fills each drum in sequence, which freed-up the operator for two hours at a time." The filler’s input piping, ball valves and the four filling lances were wrapped and sealed with heat-insulated material with internal electric wiring. This allowed the temperature to be varied depending on the product viscosity. The four lances were built as one manifold. A special four-section, slide in/out drip pan was created to cut and catch any residue at the end of each fill cycle. Powered conveyors and jump transfers were built to move the pallet loads into and out of the filling station. A platform scale with four load cells is mounted under the fill station conveyor. Filling accuracy was within one pound. If the drums are open-top, as shown in this application, the filling system can be fully automatic and doesn’t need an operator present. If the drums are tight-head, the operator is there to simply align the bung opening under each of the four lances then press the start button. The rest is automatic. All the equipment described is built and tested at the Specialty Equipment plant in Houston, Texas. If a customer is not available to witness the test, Specialty Equipment will provide a certified video of the testing process.